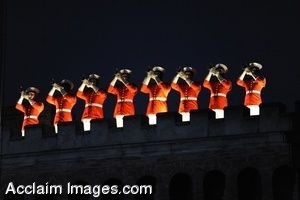 Description: Clip art photograph of members of the U.S. Marine Drum & Bugle Corps perform during the Evening Parade at Marine Barracks Washington on May 29. The "Oldest Post of the Corps," was established in 1801, and has performed military reviews and ceremonies since its founding. The present-day Evening Parade was first conducted on July 5, 1957. Clipart photograph by Department of Defense Public Domain.